When God had a message for the people, He sent His prophets. The prophets would then speak forth the word of God to kings, priests, and the people. The prophets warned the people of God’s need to punish sin, and pleaded with the people to turn to God. But the Jews almost never listened (2 Ki 17:13–14). So God exiled them to foreign lands. The northern tribes were carried off by Assyrians; the southern tribes went to Babylon for 70 years. Now the Jews had been released to return to Jerusalem and rebuild the temple of the Lord. The city is in ruins. The royal family has been reduced to governor status. The temple is under construction. But the words of the prophets still remain. And now the Jews have another chance to pay attention. God sends them a new prophet: Zechariah. This prophet has colorful visions—messages of comfort and hope to the Jews. It all begins with a simple request: “Return to Me,” declares the LORD of hosts, “that I may return to you” (Zec 1:3). Zechariah’s writings encourage and admonish the Jews of Jerusalem. He specifically affirms the governor and priest of that time (Zec 3, 4). He chastises the foolish leaders among them (Zec 11), and calls all the people to follow God and remember the words of the prophets before (Zec 1:6). But most importantly, he anticipates a full restoration of God and His people. The temple will be rebuilt, Israel will be purified, the enemies will be overcome, and the Lord Himself will dwell in Jerusalem. But this restoration isn’t only for the Jews: the Lord will rule the whole earth, and all the nations will worship Him (Zech 8:22; 14:9). 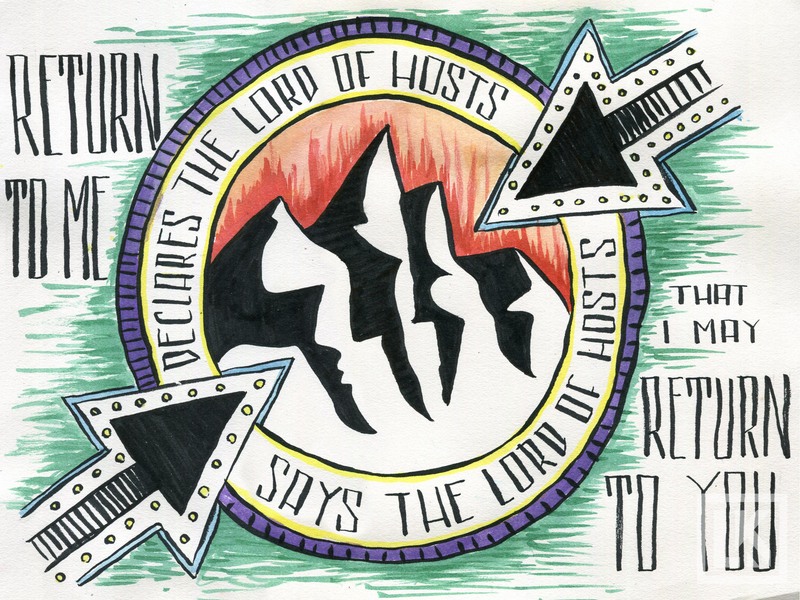 Bible verse drawings by Laura Kranz. Zechariah is the eleventh of the Minor Prophets, the last 12 books of the Old Testament. When God had a message for the people, He spoke through the prophets. His word came in visions, oracles, dreams, parables, and the like. Most of the Minor Prophets wrote about the coming destruction of Judah, Israel, or the surrounding nations, but Zechariah is different. Like Haggai and Malachi, Zechariah shows up on the scene long after the destruction took place. Of the Minor Prophets, Zechariah is easily the hardest to understand. This is partially due to the dense symbolic nature of his writings. Whereas Hosea, Micah, and others give direct instructions and warnings of what is to come, Zechariah “lifts up his eyes” to see scenes, characters, and strange objects. Zechariah is one of only two Minor Prophets who records his visions in this way; the other one is Amos (Am 7:8; 8:2; 9:1). Visions. Zechariah has vivid visions, similar to those that you see in the books of Ezekiel, Daniel, and Revelation. He sees lampstands (Zech 4:2), horses(Zech 6:2), flying scrolls (Zech 5:2), and other images that symbolize the spiritual landscape. Lucky for Zechariah—and us!—an angel interprets many of these symbols (Zech 4:4–6). The word of the Lord. This is your typical prophetic discourse, which you’ll find in almost every book of the Minor Prophets (except Jonah). This is God using Zechariah as His mouthpiece to the people through word alone. Symbolic demonstrations. Sometimes, Zechariah will do something in the physical world that represents the spiritual side of things. In one example, Zechariah forges a crown for the high priest Joshua (not the one who fought at Jericho) to remind Him that one day, there will be a Man who is both king and high priest in Jerusalem. The prophets Zechariah and Haggai were contemporaries: the book of Ezra notes that these two prophets compelled the Jews to finish rebuilding the temple of the Lord, even thought he surrounding nations were opposing them (Ezr 5:1–2). Haggai’s recorded ministry seems to conclude after three months, but Zechariah continues to preach for at least two more years (Zech 1:1, 7:1). Haggai gives brief, almost clipped messages. Zechariah is the longest book of the Minor Prophets. Haggai focuses explicitly on the present temple work, while Zechariah deals with the larger picture of Israel’s history and future. Haggai is very literal, directly addressing the economic decline and the tangible solution (building the temple). Zechariah is highly symbolic, instead pointing to the spiritual activities behind the scenes. Zechariah is ultimately a message of assurance: God has brought the Jews back to Jerusalem, and His work of restoration is far from over.